My name is Melissa, and I am a pizza addict. My mom used to tell me when I was a kid that if I kept up my habit, I would turn into pizza. Thankfully I didn’t, but I think I could still eat it everyday if I tried. Unfortunately my broke self just can’t afford that. So I had to find other ways to feed my addiction. What was my solution? Every Sunday night, my roomates and I have homemade vegetable pizza night. Not only is it cost effective and healthy, but its super easy to make. Check it out! Tip: throwing down some flour first helps it not stick! 2.) Roll over the edges for a crust, and bake it in the oven for 10 minutes at 400 degrees, or until you see the dough bubble a bit. I was more then pleased, seeing as it is almost half the fat and sodium content, half the price, and 89 calories less then the veggie pizza I have been ordering from dominos! Not to mention I split it with my two roomates, so the overall meal only cost me a little over 2 dollars! So for all you pizza lovers and addicts out there, there is hope. It’s homemade, its healthy, and it won’t cost you and arm and a leg. 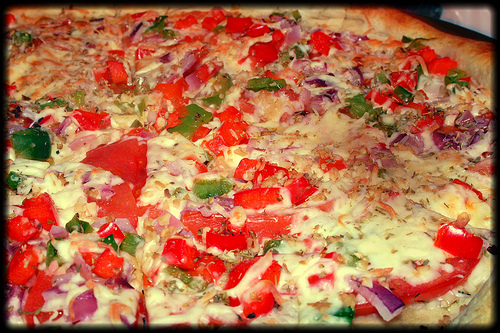 P.S.– If vegetables don’t make your mouth water, swap out the toppings. And don’t forget, take a tip from a previous post about Sharp Shopper if your looking to lessen the cost even more! ← Never be without a deal!